Who is That Man Behind The Curtain? He’s Your Live Performance Audio Describer! It almost feels like magic when someone whispers in your ear telling you what’s happening on the stage. It’s even more satisfying knowing you aren’t bugging your spouse, friend or fellow theatre goer. 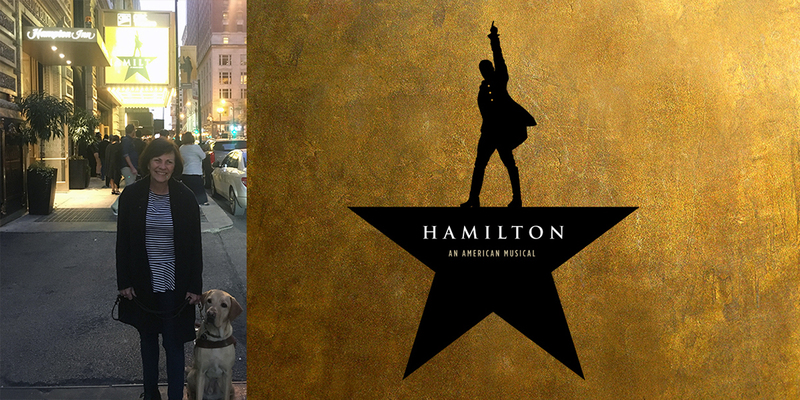 Last week, I saw Hamilton, the hit new musical that everyone is clamoring to see. You might think you wouldn’t need much audio description because of all the music. But it made a huge difference in my enjoyment factor. It was wonderful to have the characters described — from the color, length and style of their hair right down to the color of the buckles on their shoes — the description made a world of difference. Knowing when the performers were entering and leaving the stage and how the chorus was dancing really helped me follow what was going on in this fast-paced show. Here in Chicago, we have a very rich theatre scene with many of the theatres providing accessible performances. From store-front theatres to opera to Broadway in Chicago, you can usually find an audio-described live performance on their calendars. Recently, I had an opportunity to meet with Martin Wild, a professional, live performance audio describer based in Chicago. We talked at length about all that goes into providing this service — his professional training, his preparation and his love for the work. Both Martin’s parents had low vision. He had some early experience with audio description describing baseball games to his dad. 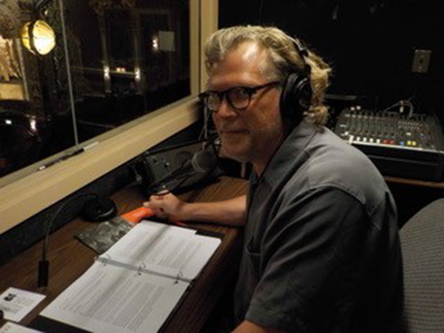 Martin has done some voice over work and has read for CRIS Radio here in Chicago. But with his love for the theatre, audio describing live performances was a perfect fit. What Goes into a Live Audio-Described Performance? Martin usually watches a performance twice prior to describing the piece. The first time through is like anyone else — he enjoys the play for what it is, but he also wants to get a feel for the piece. He’ll attend a second performance, manned with the script. He goes to work developing his own dialogue you’ll hear through your headphones. Of course, you can’t describe everything that is going on in between gaps in the dialogue. It is up to Martin to pick and choose what is important to understanding the piece. Martin also develops pre-show notes he reads before the performance. He provides information from the show bill, the show credits and cast. Martin describes the theatre — how the seating is laid out and where the exits are. He also describes the set and each character, their costume and appearance. All of this information helps you create an image in your mind and lets you follow the play more fully, completing your experience. The Chicago Cultural Accessibility Consortium, a volunteer-led group of cultural administrators and people with disabilities, encourages all of Chicago’s cultural venues to be inclusive and accessible to all. Their Access Calendar has listings of many theatre performances where audio description is provided. If you don’t see an audio-described performance on the calendar, call the theatre and inquire about audio description. Some theatres, like Broadway in Chicago, will provide this service upon request with a two- or three-week notice. Often, discounted tickets are available with seating up close for those who have some vision. When Martin talks about how he prepares for his performances, you can tell that he loves his work. Let’s not let him get away! Support our theatre community by attending an audio-described performance. We have made so many strides forward in accessible entertainment. We certainly don’t want to go backwards. And, best of all, you’ll enjoy it! Kathy is the Community Engagement Specialist at Second Sense.